(Vatican Radio) Today, 3 December 2015, the Holy Father Francis received the Prime Minister of the Independent State of Samoa, His Excellency Tuilaepa Lupesoliai Sailele Malielegaoi, who subsequently met with His Eminence Cardinal Secretary of State Pietro Parolin, accompanied by Msgr. Antoine Camilleri, under-secretary for Relations with States. During the cordial discussions, the Parties focused on some aspects of the social and economic life of the country, as well as the valued contribution of the Catholic Church in various sectors of Samoan society and, in particular, in the field of education. (Vatican Radio) Pope Francis has written a preface to a new volume of the Bible for young people, the inspiration for which came from Thomas Söding, professor of New Testament studies at Bochum university. As a father of three, Mr Söding felt it was necessary to provide a more appealing approach to the Bible for young readers. The Holy Father begins his preface saying that his old, tatty, well-thumbed Bible is his “priceless treasure”. “I would not give it away for the world”. He said he did he did not wish for a new €1000 version: “I love my old Bible… which has shared my joy and has been soaked with my tears”. He speaks about how more Christians are being persecuted nowadays than ever before because they wear a crucifix or they have a Bible. He goes on to mention Mahatma Gandhi who once said “A text has been given to you Christians, a text that has the dynamic power to make human civilization explode into a million pieces, to turn the world upside down and to bring peace to a planet torn apart by war. However, you merely regard it as a work of literature, nothing more”. Patrols, CCTV surveillance, plain-clothes police, barriers along Via della Conciliazione, metal detectors at the entrance to St. Peter’s Square. Security rehearsals are in full swing in the Vatican ahead of the Jubilee of Mercy which is to be inaugurated on Tuesday 8 December. On the day of the opening of the Holy Door, level 4 security clearance will be in force because the flow of people is not expected to be exceptionally high. In light of the threats made by ISIS jihadists in recent months, the heart of the Catholic faith worldwide is on high alert. No one is underestimating the risk involved but a number of bodies are working together to ensure everything runs smoothly and pilgrims can enjoy a peaceful Holy Year, without worries about their safety. The Jubilee security plan was put together some time ago and has been reinforced in light of the Paris attacks on 13 November. “The theme of mercy has been strongly accentuated in the life of the Church, starting with Pope Paul VI. John Paul II underlined it firmly with Dives in Misericordia, the canonisation of St. Faustina and the institution of the feast of Divine Mercy on the Octave of Easter. In line with this, I felt that it was as if it was the Lord's wish to show His mercy to humanity. It was not something that came to my mind, but rather the relatively recent renewal of a tradition that has however always existed. … It is obvious that today's world is in need of mercy and compassion, or rather of the capacity for empathy. We are accustomed to bad news, cruel news and the worst atrocities that offend the name and the life of God. The world needs to discover that God is the Father, that there is mercy, that cruelty is not the way, that condemnation is not the way, because it is the Church herself who at times takes a hard line, and falls into the temptation to follow a hard line and to underline moral rules only; many people are excluded. The image of the Church as a field hospital after a battle comes to mind here: it is the truth, so many people are injured and destroyed! … I believe that this is the time for mercy. We are all sinners, all of us carry inner burdens. I felt that Jesus wanted to open the door to His heart, that the Father wants to show us his innate mercy, and for this reason he sends us the Spirit. … It is the year of reconciliation. On the one hand we see the weapons trade … the murder of innocent people in the cruellest ways possible, the exploitation of people, of children. There is currently a form of sacrilege against humanity, because man is sacred, he is the image of the living God. And the Father says, 'stop and come to me'”. (Vatican Radio) A darkened St. Peter’s dome gave tourists and journalists a rare image on Wednesday night and Thursday morning: The famed Bernini colonnade shining brightly on its own, while the usually imposing Cupola was obscured in the background. The unusual sight was not due to technical problems or security concerns, but was part of a test ahead of a light show – called “Fiat Lux” – being organized for the Jubilee of Mercy. The opening of the Holy Door of St. Peter’s Basilica by Pope Francis, marking the start of the Jubilee of Mercy on Tuesday 8 December will be shown on satellite worldwide television in Ultra HD. The initiative is promoted by the Vatican Secretariat for Communication. Details of the television coverage of the ceremony which begins at 9:30 were published during the press conference held today in the Vatican Film Library. Images of the event are being produced by the Vatican Television Center (CTV), in collaboration with Vatican Radio and the technical collaboration of Sony, Eutelstat, Globestat and DBW Communication, “a group that has proved to be cohesive over the years and have been working on this event for the past few months,” the Prefect of the new Vatican communication dicastery, Mgr. Dario Edoardo Viganò, explained. The ceremony for the canonizations of John XXIII and John Paul II on 27 April 2014 was broadcast using 4K HD technology, in collaboration with Sky. Now, CTV has announced the introduction of cutting-edge technology for live coverage of events. The OB VAN OB8 will be fully equipped with 4k/HDR technology, with 8 Sony HDC-4300 television cameras, a PWS-4400 server and a 4K MVS-7000X switcher. The opening of the Holy Door will be broadcast using 4K Ultra HD technology, which gives high definition images, giving viewers the sensation of being at the event. (Vatican Radio) Pope Francis on Thursday afternoon participated in the a meeting of the Vatican’s Council for the Economy. A communiqué released by the Holy See Press Office on Friday said the Holy Father explained that the reason for his visit was to personally thank and encourage Council members for the important role they fulfil in the vigilance of the financial and administrative structures of the Holy See. He further confirmed the central role of the Council in this work of reform to which the Holy Father is committed. On behalf of the Council, Cardinal Reinhard Marx, the Coordinator of the Council, warmly thanked the Holy Father for his presence at the meeting and reconfirmed its full commitment to the financial and administrative reforms initiated by Pope Francis. (Vatican Radio) Pope Francis has gave his support to a two-day International Workshop on “Women and Work” taking place in Rome beginning Friday. The workshop is sponsored by the Pontifical Council for the Laity, and is focused on the dichotomy between the needs of work and family facing women today. It will consider proposals for a more effective promotion of the work of women, especially in the face of discrimination such as pay disparities and that faced by mothers in the workplace. The Holy Father sent his greetings in a telegram sent through the Secretary of State, Cardinal Pietro Parolin. (Vatican Radio) Pope Francis on Friday received the President of the Philippines, Benigno S. Aquino III, who subsequently met with the Secretary of State, Cardinal Pietro Parolin, who was accompanied by the Under-Secretary for Relations with States, Msgr. Antoine Camilleri. A statement from the Holy See Press Office called the talks “cordial,” and said they focused on the dialogue among the different parts of Philippine society, as well as the contribution of the Catholic Church in the life of the country. The statement said particular attention was given to the state of the peace process in the Mindanao - located in the south of the country – with hope being expressed that the commitment of the parties can guarantee a stable and lasting peace in the region. (Vatican Radio) Pope Francis on Thursday received the Book of Gospels which will be used for the liturgies of the upcoming Jubilee. The Book was presented by Archbishop Rino Fisichella, the President of the Pontifical Council for the Promotion of the New Evangelisation. The book – which contains the Gospel readings for the Sundays and Feast Days during the Year of Mercy – is illustrated by Jesuit artist Marko Rupnik. (Vatican Radio) The Press Office of the Holy See was the scene on Friday morning for a news conference detailing the major events and initiatives associated with the opening and progress of the Extraordinary Jubilee Year of Mercy. Present at the conference were: the President of the Pontifical Council for the Promotion of the New Evangelization, Archbishop Rino Fisichella; the Secretary to the same Council, Archbishop José Octavio Ruiz; Undersecretary to the Council, Msgr. Graham Bell. A Pilgrimage Information Center at Via della Conciliazione, 7, that opened on December 1st. This is a place to find information about the schedule of events for the Jubilee; to register for the reserved walkway to the Holy Door; to pick up the requested free access tickets for the various celebrations which are required for pilgrims; and to pick up the testimonium of participation in the Jubilee (the official and only authentic attestation of participation in the Jubilee in Rome). The office will be open 7 days/week from 7:30 AM to 6:30 PM Rome Time. Healthcare services available for pilgrims: in each of the four Papal Basilicas (St. Peter’s, St. John Lateran, St. Mary Major, St. Paul Outside the Walls) there will be a First Aid Station (It. Pronto Soccorso) equipped with a defibrillator, and with medical and nursing services provided by the Order of Malta, with the support and cooperation of Region of Lazio, which is operating an Advance Medical Post at Castel Sant’Angelo, along with the new Emergency Room at Santo Spirito Hospital, which is to be inaugurated in the coming weeks. Multiple means of communication for the deaf and blind: in particular, video-tutorials with Italian and International Sign Language (LIS), and audio files that can be downloaded from the Jubilee website (equipped with navigation aids) that describe the paths, pilgrimages to the Holy Door, and much else – including specially arrayed confessionals in Saint Peter’s Basilica and in other churches. The celebration of the opening of the Holy Door in Saint Peter’s Basilica, which will take place in Saint Peter’s Square beginning at 9:30 AM on December 8th, and will be introduced by readings taken from the four Conciliar Constitutions (Dei Verbum, Lumen gentium, Sacrosanctum concilium e Gaudium et spes), along with two passages taken from, Unitatis redintegratio on ecumenism and Dignitatis humanae on religious liberty. The President of the Pontifical Council for the New Evangelization, Archbishop Rino Fisichella, also told reporters that on Sunday, December 13th, for the first time in the history of the Jubilee Years, there will be Holy Doors opened in all the cathedrals of the world, and that local Ordinaries have been empowered for the occasion to offer the Papal Blessing to all who take part. Four artistic renderings of images that will illuminate St. Peter’s Basilica are at the link. VATICAN CITY — This week, the facade and cupola of St. Peter’s Basilica, normally a brightly lit beacon in the capital’s sky, went dark for a few hours, throwing the Italian news media into high alert. “Black out and fear for an electrical failure at St. Peter’s,” read one alarmist headline the next day. Other newspapers reported rumors of an antiterrorism drill. The power cut was actually part of a technical dress rehearsal for “Fiat Lux: Illuminating Our Common Home,” a gift from a coalition and a public art projection on the facade of St. Peter’s timed to coincide with the climate talks in Paris. It is also part of the inauguration of the Roman Catholic Church’s yearlong Jubilee of Mercy, which starts Dec. 8. “We are grateful for the gift and hope that many people will be able to enjoy it throughout the world,” said the archbishop, whose pontifical council is in charge of overseeing the Jubilee. The event will be streamed online at OurCommonHome.World . Pope Francis met Saturday with the Association of Catholic School Parents on the occasion of the fortieth anniversary of its foundation. He encouraged participants to promote education focused on the fullness of humanity, on what it means to be human and an authentic humanism. In his prepared remarks Pope Francis reiterated a call he made recently to the World Congress of Educators. Catholic education must make room for everyone, he said, and must not select recipients in an elitist manner. “There is no challenge more noble!” said the Holy Father, than when bridges are built between school and country, school and family and school and civil institutions. He encouraged parents to build union where division advances and to generate harmony in preference to exclusion. (Vatican Radio) Pope-emeritus Benedict XVI will attend the ceremony for the opening of the Holy Door in St. Peter’s Basilica, which will inaugurate the Jubilee Holy Year of Mercy. Pope Francis invited his predecessor to be at the ceremony, which will take place in the Atrium of the Basilica on 8 December, the Solemnity of the Immaculate Conception. Vatican audit for 2015 to "commence immediately"
(Vatican Radio) The Vatican’s Council for the Economy has appointed a new External Auditor for consolidated financial statements, PricewaterhouseCoopers. The Council appointed PricewaterhouseCoopers (“PwC”), one of the “Big Four” major international auditing firms, after accepting the recommendation from its Audit Committee. (Vatican Radio) Pope Francis has urged members of the Charismatic Renewal to "walk in the newness of life." In a Message sent on Saturday through the Secretary of State, Cardinal Pietro Parolin, the Holy Father called on participants of the 39th Conference of the Rinnovamento nello Spirito ("Renewal of the Spirit") taking place in Rimini, Italy, to "walk in the newness of life, and, made fruitful by personal and communitarian charismatic prayer, contribute with the renewing power of the Gospel to the Christian animation of the secular city." (Vatican Radio) Before the recitation of the Marian Prayer on the second Sunday of Advent, Pope Francis referred to Sunday’s liturgy in which John the Baptist, preaches "a baptism of repentance for the forgiveness of sins". The Holy Father pointed out that conversion is not just for atheists but also for those who already consider themselves Christians. Pope Francis continued by saying, “No one can say: I'm fine. Not true, it would be presumptuous, because "we must always be converted." (Vatican Radio) Pope Francis on Sunday prayed for the success of the Climate Change Conference currently underway in Paris. The Pope said, that as he follows the work of the Conference closely, he was reminded of a question he asked in his recent encyclical Laudato Si', that being, “What kind of world do we want to pass on to those who come after us, to the children who are growing up? The Holy Father then urged that, "for the sake of the common home we share and for future generations, every effort should be made, in Paris to mitigate the impact of climate change and, at the same time, to tackle poverty and to let human dignity flourish. Pope Francis was speaking following the recitation of the Angelus in St Peter’s Square, where he also recalled the fiftieth anniversary of a memorable event between Catholics and Orthodox. It was the signing of a Joint Declaration between Pope Paul VI and Ecumenical Patriarch Athenagoras, which took place on the eve of the conclusion of the Second Vatican Council, on December 7, 1965. He noted that it was providential that this historic gesture of reconciliation, which has created the conditions for a new dialogue between Orthodox and Catholics in love and truth, should be remembered at the very beginning of the Jubilee of Mercy. (Vatican Radio) Pope Francis on Sunday evening lit – remotely from the Vatican – the Christmas tree and nativity scene in the lower piazza of the Basilica San Francesco in Assisi. 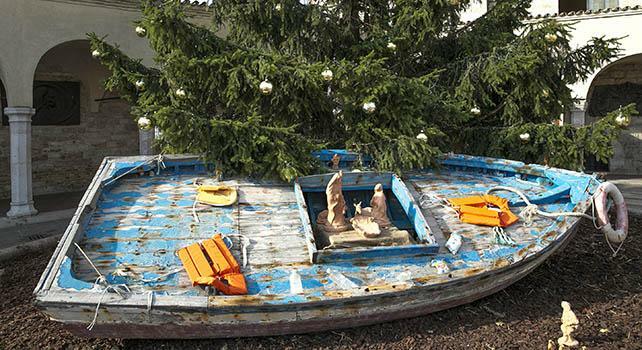 The nativity scene has been built into a seven-meter boat used by migrants to travel from Tunisia to the Italian island of Lampedusa in 2014. The ceremony was attended by 31 refugees from Afghanistan, Cameroon, Nigeria and Syria being hosted by Caritas Assisi. The Italian State Railway and Italian Navy also distributed toys to families in need. Watching that boat ... Jesus is always with us, even in difficult times. How many brothers and sisters have drowned at sea! They are with the Lord now. But He came to give us hope, and we must take this hope. He came to tell us that He is stronger than death, that He is greater than any evil. He came to tell us he is merciful, all mercy; and this Christmas I invite you to open your hearts to mercy and forgiveness. But it is not easy to forgive these massacres. It's not easy. Pope Francis: Vocations are "born within the Church"
(Vatican Radio) Pope Francis has called on all the faithful to “assume their responsibility” for the care and discernment of vocations. “Vocations are born within the Church,” Pope Francis writes. Pope Francis says priests are “especially important” in vocations discernment.